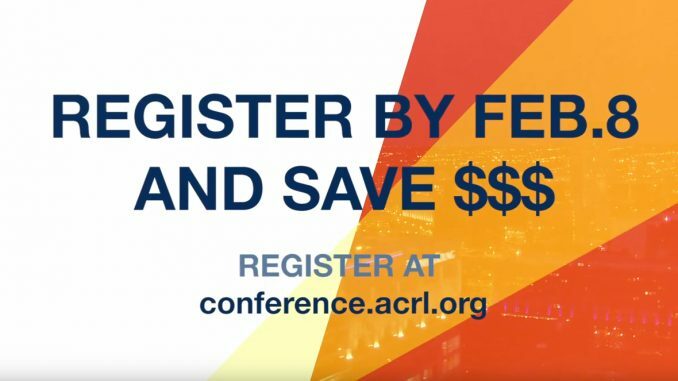 The early bird registration deadline for ACRL 2019 is coming February 8! Take advantage of discounted registration fees and save $70 or more off advance rates. ACRL 2019 features more than 500 programs carefully selected and presented by leaders in the profession offering insights and inspiration to enhance your library’s programs and services. And that’s in addition our lineup of inspirational keynote speakers and thought-provoking invited presentations. Check out our latest video to learn more about all of the awesomeness awaiting you April 10-13, 2019, in Cleveland. Registration and housing are available on the conference website.